Vandals Strike Again, But Why? You are here: Home / Student Life / Vandals Strike Again, But Why? 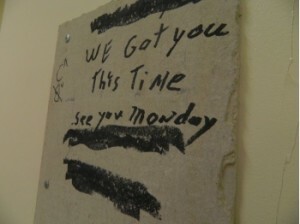 Holes in bathroom walls, graffiti and profanity. That is an annoying usual occurrence for the custodians around Penn Manor High School. “It gets very frustrating,” said Penn Manor custodian, Mark Homsher. For custodians who try very hard to keep the school clean, vandalism is anything but funny. A recent incident at Penn Manor included a large hole in the Central Complex bathroom. For a temporary fix the janitors covered the hole. A note on the cover says “Wow, the school really didn’t have time to fix this right.” However fixing it right would seem pointless if someone just destroyed what you just finished fixing. Imagine being in the middle of doing your job and receiving a call saying someone wrote a bad word in the bathroom. You need to drop exactly what you’re doing and go try to clean foul language off the wall that is sometimes carved into the stalls. The custodians even repainted the stalls and people just carved their profanity and it made it stand out even more because the two different colors makes it stand out more. A large hole in the Central Complex bathroom has been added to the long list of vandal strikes at Penn Manor. But custodians aren’t the only one’s upset about the debauchery. Students aren’t too happy about the damage done to the school environment. “It’s kind of frustrating to me that people don’t respect the school,” said Penn Manor student, Cody Diehl. Between school budget cuts and a lack of funding, every penny counts to keep the school a clean and functional learning environment, and for students who wish that teachers and administrators would be able to trust students more, vandalism isn’t helping anyone. “I think that it (bathroom graffiti) is stupid, and it makes no sense. Like why would someone destroy a bathroom wall like that. You would have to seriously go out of your way to cause that kind of destruction,” said Alexa Janaskie, a Penn Manor senior. For students that think that it is the school’s responsibility to clean up for the vandals, think again. “It’s the students responsibility to keep the school bathrooms clean and vandalism free,” said Penn Manor administrator, Krista Cox.